I hate devotionals, mostly because just about anyone can write one (such as that world-renowned New Testament scholar Sarah Palin) and thus there’s no real guarantee or even likelihood that they present any accurate biblical truth. That being said, this article is, for all intents and purposes, a devotional, but I refuse to call it that. So please enjoy today’s Midweek Dadvotional. If you’re not into Jesus, I promise I’m not trying to convert you, but this might still be worth reading. When Jesus heard [about the death of John the Baptist], he withdrew by boat privately to a solitary place. Hearing of this, the crowds followed him on foot from the towns. When Jesus landed and saw a large crowd, he had compassion on them and healed their sick. I am excessively introverted by nature, so I desire as much alone time as possible to read, write, think, or just enjoy the experience of silence. This is how I recover from dealing with people and also how to pursue self-improvement as a man. The problem is that I work with people and I live with people and therefore I don’t get as much alone time as I would like. Whenever I do get a few brief moments to myself, it feels as if it won’t be long before I’m interrupted. And when I get interrupted, I get grumpy; and when I get grumpy, I get…well, not nice. So Jesus hops in a boat and ventures off somewhere he can be alone to deal with some pretty tough emotions. Here, and other places, we find that even the Son of God needs time to himself. But somehow, a crowd of people who’ve heard all about his buckwild teaching and supernatural abilities manages to figure out where he’s heading, so that when he arrives at his destination, he finds that they’re already waiting for him. We might expect Jesus to throw up his hands and cry out, “You’ve got to be kidding me!” Or we might expect him to take his boat somewhere else, somewhere a crowd on foot can’t follow, so he can actually get away from it all. At the very least, we might expect him to feel frustrated by this turn of events. Any of those things are what I would do. However, this is Jesus we’re talking about, and I’ve come to expect that whatever I would naturally do, Jesus is going to do the opposite. If you’re like me, you’re probably feeling pretty convicted right now. I think back to the ways I handle interruptions to my alone time and can’t help but cringe at my lack of compassion. Unlike Jesus, I don’t see the needs of the people interrupting me; instead, I only see my own needs getting interrupted. Many parents reading that would probably think I’m justified in my response, but what is the message my son hears? In the moment, I can usually convince myself that I’m inviting him to be responsible for himself or to consider someone else for a change. However, as I write this, I’m starting to think that’s flying way over his head, and what he’s actually hearing is that I don’t have time for him or that I don’t care about him. Like many kids who have been adopted or are in foster care, my son isn’t your typical teenager. Because of his previous life experiences, he’s not to the point where he needs a lesson about personal responsibility; what he needs is the lesson that he is unconditionally loved, and that Dad will continue to love him even when it’s inconvenient. That message becomes encrypted when Dad’s not willing to interrupt what he’s doing to send it. Jesus embraced the interruption and used it as an opportunity to care for people. And not only that, but the passage goes on to tell us that as evening approached, the people became hungry. So using just five loaves of bread and two fish, Jesus fed the entire crowd, which numbered over five thousand. That’s right. If Jesus had sailed his boat away from the crowd or angrily yelled at them all to go away and leave him alone, he wouldn’t have performed what is arguably one of his best-known miracles. There’s a quote (perhaps by Henri Nouwen, but I’m having trouble tracking it down) about how we often become frustrated with all the interruptions to our work without realizing that the interruptions are, in fact, our work. Jesus made an incredible impact when he accepted the interruption to his alone time as his work. What opportunities for impact are we missing out on when we refuse or ignore interruptions? 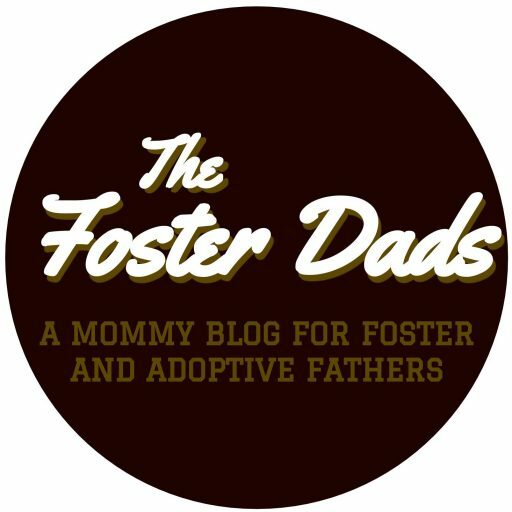 The Foster Dads exists to amplify the voices of men involved in foster care and adoption, build connections between foster/adoptive fathers, and motivate other men to consider how they can support the foster/adoptive community. Want to represent The Foster Dads in your community? You’re in luck, because now you can pick up a pack of four logo stickers. They’re two inches in diameter and great to put on car windows, water bottles, laptops, etc. Since we're just two guys, please allow some time for shipping. However, if you haven't gotten your stickers after "some time", feel free to contact us at thefosterdads@gmail.com.